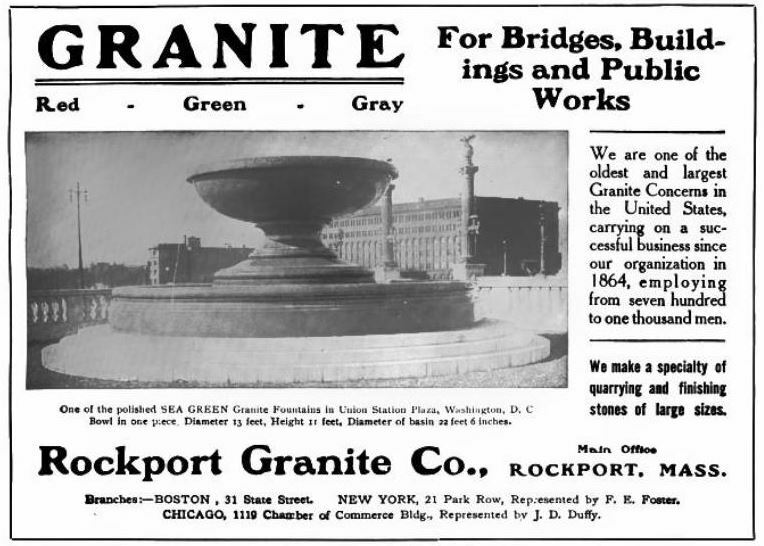 For the Rockport Granite Company, perhaps its proudest achievement was the installation of two massive granite fountains in the plaza at Union Station in Washington, D.C., where they can still be seen today. As you can see from the real-photo postcard above, the company used the image of one of these fountains for this commercial postcard touting itself as making “a specialty of quarrying and finishing stones of large sizes.” Below you can see an ad from a 1913 magazine that uses the same image. Several achievements made the fountains notable. The first was that each 13-foot wide by 11-foot tall bowl was sculpted from a single piece of granite. The sea green granite came from the Blood Ledge quarry in Bay View, part of Gloucester. (See here for a circa 1906 view of the Bay View works.) For each bowl, a single, 65-ton block of granite was cut from the quarry — an achievement noted in one magazine of the time as possibly a first — at least since the monumental engineering achievements of the ancient Egyptians. 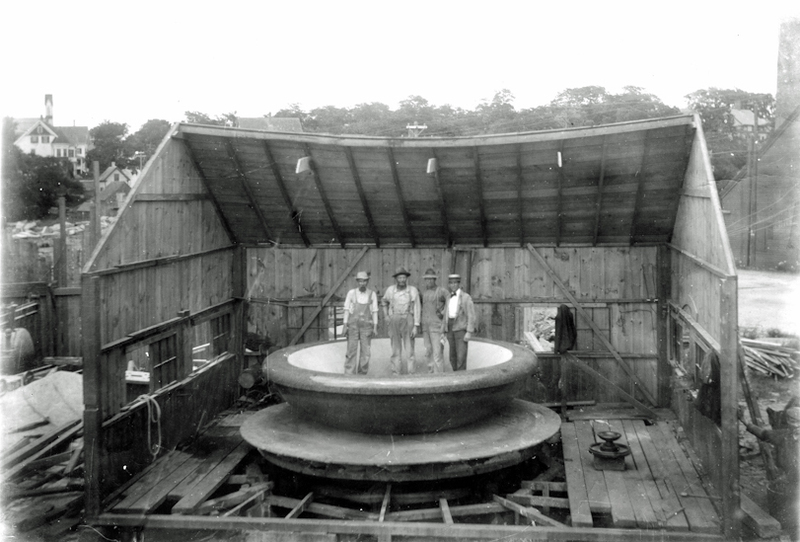 Equally impressive was the work of the stonecutters in shaping the bowls — each big enough for five men to stand within it. Each granite block was mounted on a revolving platform in a shelter near Washington St. in Bay View. Despite the scale of the job, it required delicate and careful work, with much of the cutting and shaping done by hand. The work was conducted during the spring and summer of 1910, with the first bowl finished in July 1910. Stonecutters pose in the massive bowl in the shed at Bay View. Note the track under the bowl that allowed it to rotate. One of the stonecutters later said it had been the most “ticklish” job he had ever done. Another said that the bowl’s surface was so highly polished that he could have used it as a mirror to shave. A southbound freight pulled out of Boston for Washington several days later and the flatcar carrying the bowl was attached to the tail end just behind the caboose. And Bucky rode in that bowl all the way to Union Station. There were checkpoints along the way where Bucky was to call Rogers and tell him of the progress, but the waiting was too much for Rogers, who hopped a fast train and was at Washington to meet the somewhat lamed and sleepless Bucky when he arrived, bowl and all. Although this postcard has no date, we know that the bowls were installed in 1910 and that the same image was used in the 1913 magazine ad above. It is safe to assume the photograph was taken sometime soon after the installation was completed, either in 1910 or 1911. Also, this was a real-photo postcard that used photo-processing paper produced between 1904 and 1918. This entry was posted in Uncategorized and tagged Rockport Granite Company. Bookmark the permalink. Certainly this represented perhaps the most striking improvisation of technology to their task at hand. But, in my view, the Rockport Granite Company ‘hung their hat,’ as ‘The King of Granite,’ on the 4 Custom House Eagles.